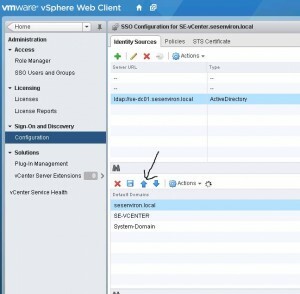 VMware vSphere vCenter Server 5.1 now uses a new SSO (Single Sign On) service to authenticate with Microsoft Active Directory when deploying vCenter. 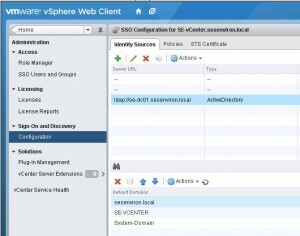 If you do not install this services and configure it for AD then you will not be able to use your domain accounts with vCenter 5.1 During the initial install you may get errors when installing SSO. KB 2034374 reports that a error of ” Error 29155 Identity source discovery error” is due to a failed attempt to automatically discover your Active Directory domain. Verify that the domain name and DNS are setup correctly. 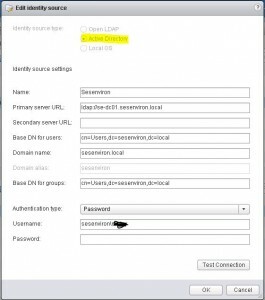 Now lets setup an AD server in vCenter to allow our Domain Accounts. First we will login to vCenter Web Client (https://127.0.0.1:9443) if you used the default ports for the web client installs. The default login is admin@system-domain and the password you set for SSO during the install process. Once you are logged in to the web client you can continue. Under the Identity Sources Tab in the right pane select the PLUS symbol to add a new AD source. This will pop up a “Add Identity Source” window, select the active directory radio button and fill out the requested information with you AD Domain name and the “OU” the holds your users and groups. Here is the generic information you will need just replace the sesenviron.local with your domain and then place your AD credentials at the bottom. Now that we have a AD server assigned as a source we must now add this newly created connector to our “Default Domains ” list. Now that we have it in our Default Domains list lets move it up to be our primary source. To do this highlight the AD domain name and select the blue arrow head pointing up and move the domain name to the top of the list . Now lets select the small floppy disk icon to save the changes to the default domain list box. 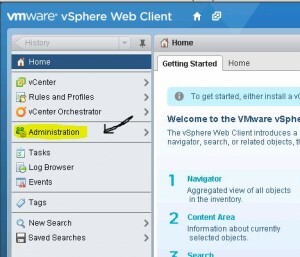 Once this is complete we should be able to open up the vSphere client application and log in with domain access. 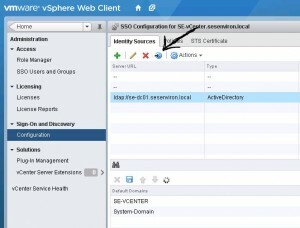 You should be using a domain level admin to access vCenter.